Therese responds to Cat: We certainly went on quite a journey together and it was my great honor and privilege to be a steady voice for your essential Self – as you put it… for your highest self. I never waivered in seeing your radiant core despite the times when “the real Cat” seemed far away. 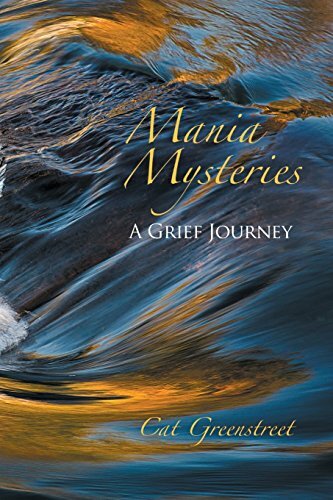 More on the book from Amazon: Mania Mysteries is a book about a manic episode of a high-functioning 66-year-old professional woman with strong, loving relationships. How and why this happened is part of the mystery. Connecting this psychic upheaval to the loss of her beloved sister, Greenstreet suggests that such eruptions are sometimes crucial for growth and transformation to a healthier integration of self. Therese Bimka was one of the contributors featured in the book Deep Play edited by Dennis McCarthy. Read the review by Nancy Eichhorn, PhD in Somatic Psychotherapy Today and find out more about the book below. "Therapeutic deep play has the capacity for children to express deep emotions, overcome seemingly insurmountable issues and resolve serious problems. Working with children in this profound way, therapists are able to not only eliminate symptoms, but to change the very structure of how children live with themselves, their defense and belief systems. The contributors to this book all work deeply, allowing children to take risks in a safe environment, and become fully absorbed in physical play. 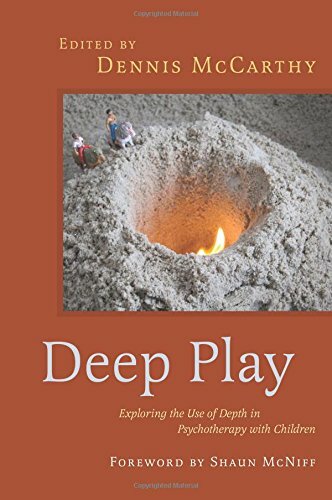 Chapters include play with deep sandboxes, clay, water, and various objects, and look at a range of pertinent case studies to demonstrate the therapeutic techniques in practice, alongside the theoretical concepts in which they are grounded. A new theoretical approach is established that takes from psychoanalysis as well as neuroscience and behaviourism, and offers a depth psychology approach in the treatment of children. This will be a valuable resource for anyone working therapeutically with children through play, including play therapists, psychotherapists, psychologists, arts therapists, counselors, social workers and family therapists." “What is it that refuses to be broken? What is it - that remains luminous? [In my work I have come to know wholeness – to feel that and trust that wholeness]– not as a theory but as a law – like gravity. If you drop a stone – it will hit the ground. This is not an issue of faith – it’s a fact and this wholeness is also a fact and if somehow by my being in the company of the people I serve - if I can mirror that [wholeness] in any way - long enough for them to begin to see, to feel, to imagine that this is true for them. Then that’s one of the gifts I hope that I bring to people and situations……This is where I have been called. Jung was born in 1875 in Kesswil Switzerland. He was born at a time when the field of psychology was newly emergent. It was a very exciting time in history as our understanding of psyche and stages of human development underwent a radical paradigm shift due to the discoveries and teachings of Sigmund Freud. Jung was Freud’s most prominent protégé but eventually Jung broke with Freud over fundamental differences in how each man viewed and understood the psyche. It has been documented that there are over 400 references to pathology in the writings of Sigmund Freud but not 1 reference pertaining to mental health – that is to the healthy aspects of psychic functioning. This in a nutshell captures the core difference; while Freud was pathologically oriented – meaning he was focused on what is wrong with us/ what is not working. Jung was teleologically oriented – meaning he was focused on what is right with us or whole within us. What does it mean to hold a teleological view of psyche? It is the belief that everything in psyche – everything that shows up- is seen as purposeful and in service of self-actualization and healing. All symptoms have meaning and carry information we need for our transformation. For Jung, this includes depression, anxiety and even psychosis. – everything is purposeful. While Freud treated people in terms of their symptoms which is reductionist model, Jung sought to activate the transformation towards wholeness. In many ways, Freud had a fundamentally pessimistic view of humanity as a conglomeration of human drives and instincts that unconsciously control the psyche – primarily driven by our sexual and aggressive impulses. Freud was however undoubtedly a genius as he did identify and discover the existence of the unconscious – heralding a radical paradigm shift in our understanding of human nature. Freud also is responsible for discovering and naming the defense mechanisms of the ego (which was expanded upon by his daughter Anna Freud) and for his strong belief that the first 5 years of life are formative in terms of life long patterns. All of these have been foundational for the field of psychology. These contributions were radical and they transformed how we think of children and how we approach child rearing and concepts of human development. One of the areas that Freud is criticized is for believing that these formative years are conclusive – that the die is cast - so to speak. And while we know the first five years are very impactful, Freud did not give as much credence to the belief that we can fundamentally change and grow over the course of the life cycle based on experience, reparative relationships and based on shifts in consciousness available to us through spiritual practice. Jung had a number of differences with Freud. His conceptualization of the unconscious for example was very different. He conceptualized a personal unconscious which is unique to each of us, a familial unconsciousness whereby we inherit intergenerational patterns, beliefs, habits etc, a cultural unconscious which holds our tribal and religious heritages, and finally the collective unconscious – the inherited storehouse of the universal archetypal patterns of humanity – the archetypal library - if you will - that apply to all people everywhere. Jung also believed paranormal and soul encounters to be real, Freud interpreted these states in pathological terms like the “Messiah complex” for example. It was Jung who brought the soul into the field of psychotherapy. He believed that the only disease is normalcy –meaning a life of mediocrity. This disease of “averageness” could lull the psyche to sleep – rendering dormant – at least for a while… the innate drive towards wholeness. While Freud became the dominant voice in the fields of psychology for many decades – Jung became popular outside of these circles.- more in what we call the human potential movement or with new age seekers. He never became really popular within his own field. Despite this - He is very well know for important psychological contributions - Jung coined a number of psychological concepts which continue to this day to be popular and relevant and very much part of our normal everyday language: complex, archetype, persona, shadow, synchronicity, active imagination, individuation, anima and animus, personality typology, the collective unconscious and he rediscovered and activated alchemy. The sheer magnitude of his work is vast. For the purposes of this article, I will focus on the innate drive towards wholeness - known in Jungian terms as the individuation process including Jung’s understanding of the union of opposites, the shadow, and the archetypes. But since no system ever gives its power up willingly – that is without a fight – the ego typically will fight – sometimes quite ruthlessly before it relinquishes its false rule over the inner kingdom – often this a time when we experience crisis – when people might seek out a spiritual counselor or therapist . The good news however is that when the ego finally does relinquish its control – a recalibration – a new homeostasis is found and the ego embraces its new position relative to the Self archetype. Instead of false or petty ruler, it becomes the loyal servant. This new re-constructed ego has the capacity to be responsive, creative, flexible and is available for the big work of transformation. So we are not trying to get rid of ego as is often misunderstood, but we are wanting ego to recognize its’ true place of service. Being able to recognize and name this process for someone can bring extraordinary relief. I remember… vividly… when I had my ego shattering experience while on a spiritual pilgrimage with Native American elders about 25 years ago. These elders had had a collective vision and were walking across the country from east to west as a pray for the earth. I heard them speak at the open center and the next day I joined the pilgrimage and walked from Brooklyn to Pennsylvania over the course of 10 days. During the walk – I had a profound dark night of the soul. Thank goodness I was working with a therapist/spiritual counselor who could hold this space and could name what was happening. That alone gave me the tools to find my inner resiliency to navigate the turbulent waters of this challenging transformation. Hence the value in the map – being able to say this is a stage of development along the spiritual journey. This offers a critical anchor in the storm. Another key feature of Jungian psychology is that Jung believed that psyche was self-regulating; this is really key - meaning that if you follow the underground river so to speak, it will only give you the teachings, lessons that you can handle. Jung strongly believed that the inner realms have all the information we need to move towards our own wholeness and self actualization. It’s all in there….in fact Jung himself traveled far into the inner realm in search of guidance. Like a shaman descending into the depths of psyche, he discovered through his own “plunge” that profound guidance is available through dreams, expressive modalities like art, in symbols, through the archetypes, in the fertile soil of the active imagination process., in fact he coined that terms to describe his inner process. He himself was a living breathing example of the active imagination process. In fact The Red Book is Jung’s journal/manuscript documenting 19 years of this deep inner journeying. Amazingly, the manuscript sat in a family vault for decades until it was published just about 10 years ago. It had been locked up in the family vault for 40 years! This inner guidance that Jung was so intimate with speaks the language of image, symbol, myth and fairytale, archetype. These symbols and myths, Jung discovered along with others like Joseph Campbell are universal. Both men spent enormous time documenting this. And what they found was that these myths, fairy tales, folklore and symbols point to or engage directly with the archetypal library of human consciousness. In other words myths are representations of the inherited psychic DNA of our collective humanity. From a Jungian perspective - The diverse manifestations of these symbols, myths and archetypes across cultures and across historical periods may be different (the form may be different), but the underlying human story is the same. Different packaging but the core is universal. Just in case you were wondering… Let’s get one thing clear – we all have a shadow J There’s no getting around it. It’s not exactly something you grow out although the shadow can loosen its grip and become more integrated. In fact, not only are there individual shadows, there are cultural/ collective shadows – this is when we project onto a group of people traits and attributes that are repressed in our society or traits that are not integrated in a healthy way in our own culture. Basically - The shadow contains what we perceive to be our negative traits, negative aspects of self, the parts of self that we don’t like, the parts that aren’t so pretty, where we are perhaps a bit messier, aspects of self we may hold in distain or even contempt. Much of our shadow is developed in childhood where we learn to put away parts of ourselves that were not valued by our family or by our culture. In addition to personality traits, Our shadow can also hold strong emotions that are exiled – emotions that we were not taught how to embrace, how to live with, how to manage – like anger or feelings of vulnerability for example. These exiled parts can become quite empowered – even autonomous as split off little entities in psyche. The more woundedness or trauma – the more split off. Shadow work is bringing conscious to what has been hidden and rejected and unexamined. Seena Frost founder of SoulCollage says that everything that has form has a shadow, that form itself casts a shadow – all archetypes for example have both life affirming and shadow energies. According to Frost – in her cosmology - only Source has no form and is without a shadow. In Jungian terms we explore the shadow archetypally. Having an archetypal view of psyche invites the perspective that within us all are multiple aspects of Self or one might say – multiple archetypal energies which co-exist within us. This is opposite to the notion of a fixed and singular self. In clinical language – we talk about working with the parts and for those of you interested in this work – you can look up Richard Schwartz – founder of Internal Family Systems which is a whole training program geared towards working with the internal parts. I find this conceptualization of the psyche very useful. If we understand that as human beings, we all carry all the archetypal energies or potentials – it normalizes the shadow material and from a spiritual perspective challenges the notion of separateness and other. Was really me and me” (Wilber, 1979, p. 95). As human beings - We all have anger or rage, we all have shame, we can be intolerant or impatient, we can be judgmental and critical All of these traits exist as part of the human condition. And if we understand that any of these feelings or aspects represents part of self, but not Self itself… we begin to dis-identify. So in this model, there is room for all of who we are. This is very, helpful, very liberating to ourselves and to our clients. Viewing the contents of our minds and hearts as the work of archetypal forces depersonalizes much of our most human behavior. It counteracts the tendency we have to heap unnecessary blame on ourselves when we fail….OR… to get a thick head when we succeed. Thinking archetypally also helps us refrain from passing harsh judgments on others on the one hand, or placing them on a pedestal, on the other. When we love and when we hate, when we are powerful and when we are weak, when we are sure and when we are confused: these are archetypal forces at play within us, forces that we can learn to harness, to subdue, or to balance. Jungian analyst Eugene Pascal, and author of the very useful book Jung to Live By, writes, “The psychological dilemma plaguing most of humanity is that the archetypes live us instead of us living them. Lesser, Elizabeth (2008-11-18). The Seeker's Guide: Making Your Life a Spiritual Adventure (Kindle Locations 4011-4017). Random House Publishing Group. Kindle Edition. The shadow loves the dark where conditions are ripe so it can grow and fester. Shining the light of compassion, kindness, acceptance and curiosity – brings the shadow out of darkness into the light of consciousness. This is what integrates the shadow. Why is it important to work with the shadow? To do Shadow work.. There are many reasons but the first foremost is that we can not experience our wholeness without bringing the exiled aspects of self back home. In shamanic terms – this is sometimes called soul retrieval. The bigger the shadow, the more energy it takes to suppress – that means energy not available for living. Also if we under stand the shadow itself as comprised of the exiled aspects of self – each of the exiles also contain their own energy and power. So not only does it take energy to repress the shadow but the shadow material itself carries its own aliveness that is not at the service of self actualization. In Jungian work we talk about be-friending the shadow – like a long lost friend or family member. We talk about getting to know this part – with open curiosity - what s/he thinks, feels, needs and can offer. The perspective is that there is wisdom and there are gifts which the shadow holds. Certainly there is an vitality that we want to integrate – that we need to integrate. Fundamental to this work is the art of being truly non-judgmental . This is true to both to access the shadow and to heal the shadow and by healing I mean integrating. Like Wayne Muller’s excerpt about his fundamental belief in innate wholeness as a law not an act of faith). Clients can sense if these beliefs are deeply rooted and that will either invite or shut down the shadow. The shadow is used to being shunned and is very sensitive. Often shadow work involves dialoguing with the shadow in whatever form it takes. This is where the archetypes come into play because the shadow is made manifest in the world through the archetypes. So when we encounter the shadow as Jung did over his 19 years of deep work - the best way to dialogue with the shadow is through journaling, expressive arts, guided visualization, authentic movement, soulcollage, sandplay, psycho drama, storytelling. In dialoguing with the shadow – you are participating in the active imagination process and trusting that whatever form the shadow shows up in has value and benefit for your growth and development. It is teleological. We don’t expect the shadow to be pretty and nice. So we don’t judge what shows up- we work with what shows up and if you believe in your own innate goodness and wholeness, you can delve into the shadow material with greater ease. In counseling – often counselees can be stuck on one end of a particular polarity – too nice, too angry, too tolerant, too intolerant etc. We often say you need access to a genuine NO to have a genuine Yes and this speaks to the value of owing and having access to the opposite energy of a polarity. I often think of this as a pendulum swing. To access the opposite energy – the pendulum usually swings radically to the other end and this sometimes looks rather messy and ungrounded. That’s why you have to be really careful and cautious whenever you are engaging the shadow. It is a phase of healing before a new calibration is found – out of the duality – there is the third path not yet known. Working with the union of opposites is a core philosophy for Jung on the path of individuation and wholeness. The Shadow is often very well defended. I want to end with a word of caution about working with shadow. Its important to know about the shadow and to recognize it so you can name it. But you need to be an experienced practitioner to work with the shadow directly and you need to have a well established rapport and engagement with your counselees to enter this material because you can unleash some intense stuff. And of great importance, you need your own support system as a practitioner through paid or peer supervision to do this work. Lastly – it is always a useful reminder that you that you can’t do this work with clients unless you yourself have worked with your own shadow. You can’t take clients past where you haven’t been yourself. Bio: Therese Bimka LCSW is a psychotherapist in Private Practice in The Hudson Valley and in Park Slope Brooklyn working with children and adults. She is also the Director of The Interspiritual Counseling Progam at One Spirit Interfaith Alliance where she designs curriculum and trains interfaith ministers and wellness practitioners in spiritual counseling. This article represents a portion of a lecture given at One Spirit.